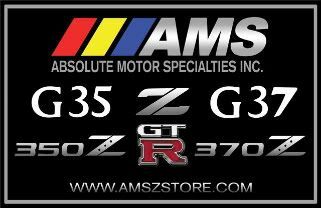 GTRPWR Forums > Marketplace > Vendor Marketplace > AMS - Absolute Motor Specialties Inc.
AMS MEGA - BRAKE GB! Supplies Limited! 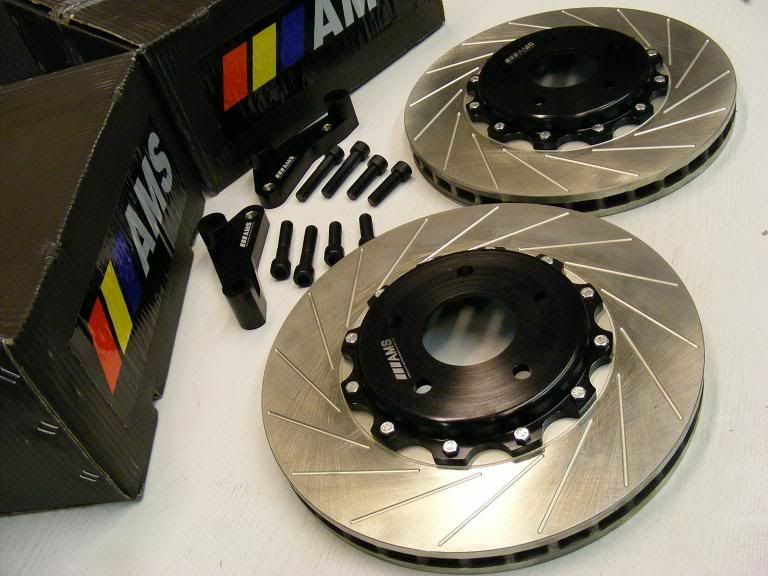 • AMS 2-piece rotors shave 1.1 lbs each vs standard sized Z32 1-piece rotors - each pound of unsprung weight is comparable to shaving 4 lbs off the chassis! • 2-piece design benefits include the ability to allow the cast iron disk to expand/contract uniformly as temperatures rise/fall under hard applications! Minimum distortion leads to increased rotor duration! 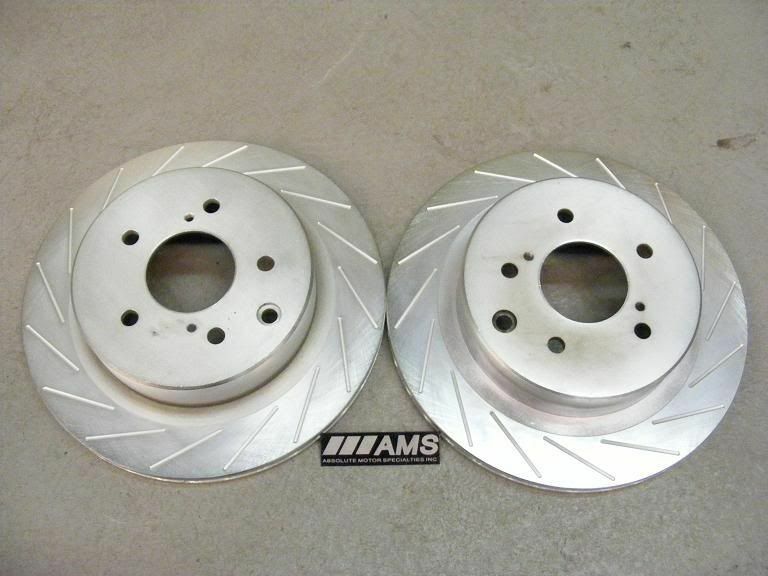 • 2-piece R33 rotors increase braking leverage (less force required for the same braking dynamics). Multi-pillar vanes ensure maximum cooling! 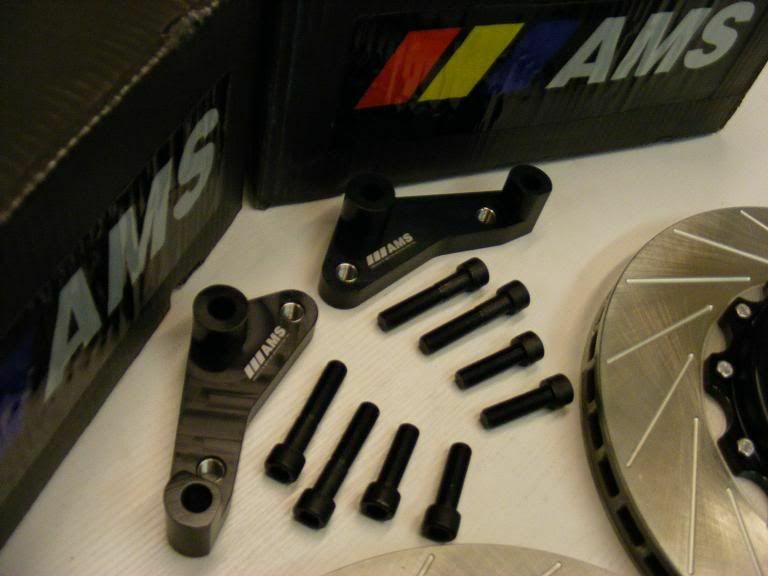 • AMS rotors feature 16-slots for aggressive bite! Slots eliminate the possibility of cracking versus crack-proned cross-drilled variants! * Kit Requires 17" rims to fit! The above BBK's are serviceable as well! AMS sells replacement rings should they be needed! They are listed on our web-site. 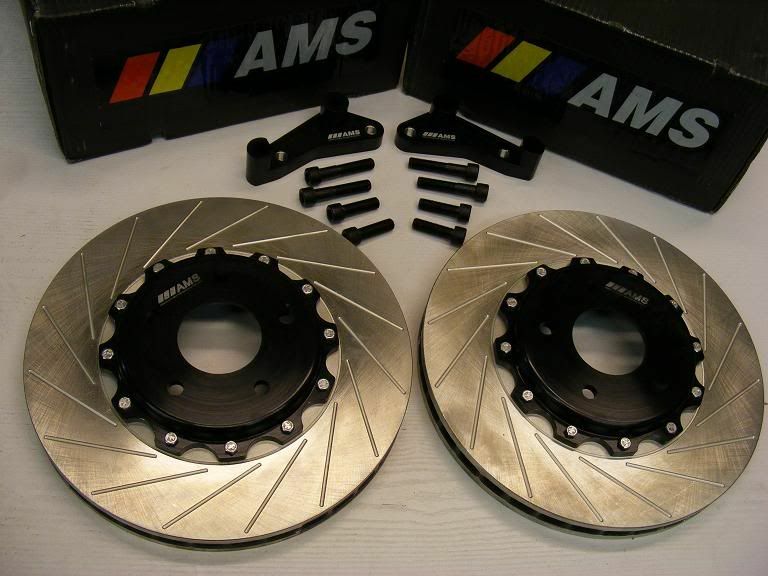 For Both the Skylines and R32 GTR's the AMS Max-Slot Rear Rotors can be fitted! Online price is $175 USD. GB is $150 CDN plus Shipping! For those buying the Front BBK and a set of Max-Slot Rears we will provide AMS Carbon Ceramic Rear Pads for FREE as well! Another $58 USD value! • Compliments the AMS Carbon-Ceramic Pads perfectly! For non-GTR Skylines the following kit offers the best bang for the buck! 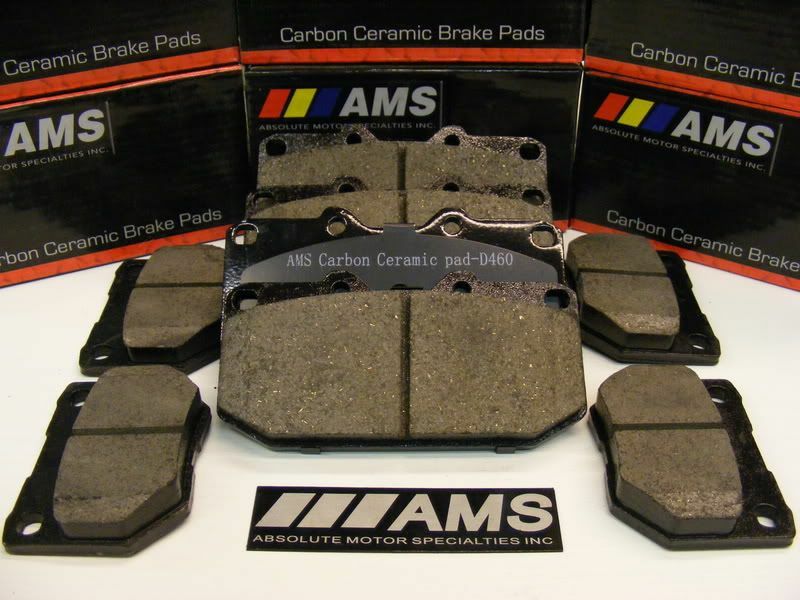 Included are F/R AMS Max-Slot Rotors and AMS Carbon-Ceramic Pads F/R! Online price is $348 USD. Special is $299 Plus Shipping! Forms of Payment are Direct Debit Transactions (e-mail), Paypal (add 3% fee), Chq, Money Order, Cash. PM or e-mail for shipping quotes and provide a full address. Parts ship usually next business day once payment is confirmed! Re: AMS MEGA - BRAKE GB! Supplies Limited! Now THAT is Special Forum Vendor Pricing ! Great to have you onboard now Vuk ! 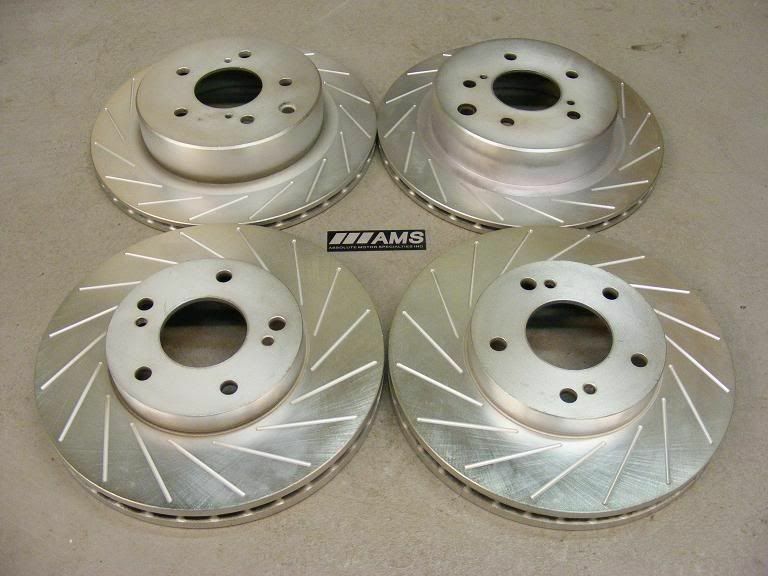 how much larger then stock bnr32 rotors are these? and what does a two piece vspec style weigh? AMS R33-V-Spec weigh in at about 20 lbs.